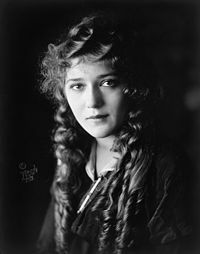 Mary Pickford, asıl adı Gladys Mary Smith (d. 9 Nisan 1892 - ö. 29 Mayıs 1979), Kanadalı sinema oyuncusu. İlk film yıldızlarından biri olmuş, sessiz sinema döneminde Amerika'nın sevgilisi olarak adlandırılmış ve sinema yaşamının doruğunda ABD'nin en ünlü ve en zengin kadınları arasında yer almıştır. Sahneye ilk kez 5 yaşında Toronto'da çıktı.Sekiz yaşında bir turneye katıldı ve sonraki 10 yıl içinde Broadway'deki çeşitli yapımlarda rol aldı.Griffith'in The Lonely Villa (1909) adlı filminde başrol oynadı. Daha sonra kendini tümüyle sinemaya verdi ve Adolph Zukor'un film şirketi Famous Players Film Company'nın en önemli oyuncularından biri oldu. 1929 yapımı Coquette filmindeki Norma Besant rolüyle En iyi kadın oyuncu oscarını kazandı. Bu filmlerin büyük bir kısmı AD.W. Griffith tarafından yönetilmiştir. 1. The Violin Maker of Cremona. 6/7/09. 2. The Lonely Villa. 6/10/09. 3. The Son's Return. 6/14/09. 5. Her First Biscuits. 6/17/09. 6. The Peach-Basket Hat. 6/24/09. 7. The Way of Man. 6/28/09. 9. The Country Doctor. 7/8/09. 10. The Cardinal's Conspiracy. 7/12/09. 12. Sweet and Twenty. 7/22/09. 14. A Strange Meeting. 8/2/09. 15. They Would Elope. 8/9/09. 16. His Wife's Visitor. 8/19/09. 17. The Indian Runner's Romance. 8/23/09. 19. The Seventh Day. 8/26/09. 20. The Little Darling. 9/2/09. 21. The Sealed Room. 9/2/09. 22. 1776 or The Hessian Renegades. 9/6/09. 24. The Broken Locket. 9/16/09. 25. In Old Kentucky. 9/20/09. 27. The Little Teacher. 10/11/09. 28. His Lost Love. 10/18/09. 29. In the Watches of the Night. 10/25/09. 30. What's Your Hurry? 11/1/09. 31. The Gibson Goddess. 11/2/09. 33. The Light That Came. 11/11/09. 34. A Midnight Adventure. 11/18/09. 35. The Mountaineer's Honor. 11/25/09. 36. The Trick That Failed. 11/29/09. 38. To Save Her Soul. 12/27/09. 41. The Englishman and the Girl. 2/17/10. 43. The Thread of Destiny: A Story of the Old Southwest. 3/7/10. 44. The Twisted Trail: A Story of Fate in the Mountain Wilds. 3/24/10. 46. As It Is In Life. 4/4/10. 47. A Rich Revenge: A Comedy of the California Oil Fields 4/7/10. 48. A Romance of the Western Hills. 4/11/10. 49. The Unchanging Sea. 5/5/10. 50. Love Among the Roses. 5/9/10. 51. The Two Brothers: In the Days of the Padres. 5/14/10. 52. Ramona: A Story of the White Man's Injustice to the Indian. 5/23/10. 53. In the Season of Buds. 6/2/10. 54. A Victim of Jealousy. 6/9/10. 55. A Child's Impulse. 6/27/10. 57. Muggsy's First Sweetheart. 6/30/10. 59. What the Daisy Said. 7/11/10. 60. The Call to Arms. 7/25/10. 61. An Arcadian Maid. 8/1/10. 62. When We Were In Our 'Teens. 8/15/10. 63. The Sorrows of the Unfaithful. 8/22/10. 65. Muggsy Becomes a Hero. 9/1/10. 66. A Gold Necklace. 10/6/10. 68. A Lucky Toothache. 10/14/10. 69. Waiter No. 5. 11/5/10. 71. Song of the Wildwood Flute. 11/21/10. 72. A Plain Song. 11/28/10. 74. When A Man Loves. 1/5/11. 75. The Italian Barber. 1/9/11. 77. A Decree of Destiny. 3/6/11. Bu filmlerin büyük bir kısmı Thomas H. Ince tarafından yönetilmiştir. 78. Their First Misunderstanding. 1/9/11. 80. Maid or Man. 1/30/11. 81. At the Duke's Command. 2/6/11. 83. While The Cat's Away. 2/9/11. 84. Her Darkest Hour. 2/13/11. 86. A Manly Man. 2/27/11. 87. The Message in the Bottle. 3/9/11. 89. In Old Madrid. 3/20/11. 93. The Fair Dentist. 5/8/11. 94. For Her Brother's Sake. 5/11/11. 95. The Master and the Man. 5/15/11. 96. The Lighthouse Keeper. 5/18/11. 97. Back to the Soil. 6/8/11. 98. In the Sultan's Garden. 7/3/11. 99. For the Queen's Honor. 7/6/11. 100. A Gasoline Engagement. 7/10/11. 101. At a Quarter of Two. 7/13/11. 103. The Skating Bug. 7/31/11. 104. The Call of the Song. 8/13/11. 105. The Toss of a Coin. 8/31/11. 106. 'Tween Two Loves. 9/28/11. 107. The Rose's Story. 10/2/11. 108. The Sentinel Asleep. 10/9/11. 109. The Better Way. 10/12/11. 110. His Dress Shirt. 10/30/11. İlk filmi George Loane Tucker, geri kalanları ise büyük bir olasılıkla Owen Moore yönetmiştir. 112. The Courting of Mary. 11/26/11. 113. Love Heeds Not the Showers. 12/3/11. 114. Little Red Riding Hood. 12/17/11. 115. The Caddy's Dream. 12/31/11. 116. Honor Thy Father. 2/9/12. Bu dönemdeki filmlerin "Won By a Fish" dışında kalanları, yine Griffith tarafından yönetilmiştir. 117. The Mender of Nets. 2/15/12. 120. The Female of the Species. 4/15/12. 121. Just Like a Woman. 4/18/12. 123. The Old Actor. 5/6/12. 124. A Lodging for the Night. 5/9/12. 125. A Beast at Bay. 5/27/12. 127. Lena and the Geese. 6/17/12. 128. The School Teacher and the Waif. 6/27/12. 129. An Indian Summer. 7/8/12. 130. The Narrow Road. 8/1/12. 131. The Inner Circle. 8/12/12. 132. With the Enemy's Help. 8/19/12. 133. A Pueblo Legend. 8/29/12. 135. So Near, Yet So Far. 9/30/12. 136. A Feud in the Kentucky Hills. 10/3/12. 137. The One She Loved. 10/21/12. 140. The New York Hat. 12/6/12. 141. The Unwelcome Guest. 3/15/13. 1. In the Bishop's Carriage (Edwin S. Porter) 9/10/13. Oyuncular: David W. Hall, House Peters. 2. Caprice(J. Searle Dawley) 4 reels. 11/10/13. Oyuncular: Ernest Truex, Owen Moore, Louise Huff, Howard Missimer. 3. Hearts Adrift (Edwin S. Porter) 4 reels. 2/10/14. 4. A Good Little Devil (Edwin S. Porter) 5 reels. 3/1/14. Oyuncular: Ernest Truex, William Norris, Edward Connelly. 5. Tess of the Storm Country (Edwin S. Porter) 5 reels. 3/30/14. Oyuncular: Harold Lockwood, Olive Fuller Gordon, David Hartford. 6. The Eagle's Mate (James Kirkwood) 5 reels. 7/1/14. Oyuncular: James Kirkwood, Ida Waterman. 7. Such a Little Queen (Hugh Ford) 5 reels. 9/21/14. Oyuncular: Carlyle Blackwell, Russell Bassett, Arthur Hoops, Harold Lockwood. 8. Behind the Scenes (James Kirkwood) 5 reels. 8/26/14. Oyuncular: James Kirkwood, Lowell Sherman, Ida Waterman, Russell Bassett. 9. Cinderella (James Kirkwood) 4 reels. 12/28/14. Oyuncular: Owen Moore, Georgia Wilson. 10. Mistress Nell (James Kirkwood) 5 reels. 2/1/15. Oyuncular: Owen Moore, Arthur Hoops, Ruby Hoffman. 11. Fanchon, The Cricket (James Kirkwood) 5 reels. 5/10/15. Oyuncular: Jack Pickford, Lottie Pickford, Gertrude Norman, Jack Standing, Fred Astaire, Adele Astaire. 12. The Dawn of a Tomorrow (James Kirkwood) 5 reels. 6/7/15. Oyuncular: David Powell, Forest Robinson, Robert Cain. 13. Little Pal (James Kirkwood) 5 reels. 7/1/15. Oyuncular: Russell Bassett, George Anderson. 14. Rags (James Kirkwood) 5 reels. 8/2/15. Oyuncular: Marshall Neilan, Joseph Manning, J. Farrell MacDonald. 15. Esmeralda (James Kirkwood) 4 reels. 9/6/15. Oyuncular: Ida Waterman, Fuller Mellish, Arthur Hoops, Charles Waldron. 16. A Girl of Yesterday (Allan Dwan) 5 reels. 10/7/15. Oyuncular: Gertrude Norman, Frances Marion, Jack Pickford, Donald Crisp, Marshall Neilan, Glenn Martin. 17. Madame Butterfly (Sidney Olcott) 5 reels. 11/8/15. Oyuncular: Marshall Neilan, W.T. Carleton, Olive West, Caroline Harris. 18. The Foundling (John B. O'Brien) 5 reels. 1/2/16. Oyuncular: Edward Marindel, Maggie Weston, Mildred Morris, Marcia Harris. 19. Poor Little Peppina (Sidney Olcott) 7 reels. 3/2/16. Oyuncular: Eugene O'Brien, Edwin Mordant, Edith Shayne, Cesare Gravina, Jack Pickford, W.T. Carleton. 20. The Eternal Grind (John B. O'Brien) 5 reels. 4/17/16. Oyuncular: John Bowers, Robert Cain, Loretta Blake, Dorothy West. 21. Hulda From Holland (John B. O'Brien) 5 reels. 7/31/16. Oyuncular: Frank Losee, John Bowers, Russell Bassett. 22. Less Than the Dust (John Emerson) 7 reels. 11/2/16. Oyuncular: David Powell, Mary Alden, Cesare Gravina, Russell Bassett. 23. The Pride of the Clan (Maurice Tourneur) 7 reels. 1/8/17. Oyuncular: Matt Moore, Kathryn Browne, Warren Cook. 24. The Poor Little Rich Girl (Maurice Tourneur) 6 reels. 3/5/17. Oyuncular: Madelaine Traverse, Charles Wellesly, Gladys Fairbanks, Frank McGlyn, Herbert Prior, Marcia Harris. 25. A Romance of the Redwoods (Cecil B. DeMille) 7 reels. 5/14/17. Oyuncular: Elliott Dexter, Charles Ogle, Tully Marshall, Raymond Hatton. 26. The Little American (Cecil B. DeMille) 5 reels. 7/2/17. Oyuncular: Jack Holt, Hobart Bosworth, James Neil, Guy Oliver, Ben Alexander, Walter Long, Raymond Hatton. 27. Rebecca of Sunnybrook Farm (Marshall Neilan) 6 reels. 9/3/17. Oyuncular: Eugene O'Brien, Helen Jerome Eddy, Charles Ogle, Marjorie Daw, Josephine Crowell, ZaSu Pitts, Wesley Barry. 28. A Little Princess (Marshall Neilan) 5 reels. 11/12/17. Oyuncular: ZaSu Pitts, Norman Kerry, Katherine Griffith, Anne Schaefer, Theodore Roberts, Gertrude Hort, Gustav von Seyffertitz. 29. Stella Maris (Marshall Neilan) 6 reels. 1/21/18. Oyuncular: Conway Tearle, Marcia Manon, Ida Waterman, Josephine Crowell. 30. Amarilly of Clothes-line Alley (Marshall Neilan) 5 reels. 3/10/18. Oyuncular: Norman Kerry, Herbert Standing, William Scott, Ida Waterman, Wesley Barry, Kate Price. 31. M'Liss (Marshall Neilan) 5 reels. 5/12/18. Oyuncular: Theodore Roberts, Tully Marshall, Thomas Meigham, Charles Ogle, Monte Blue. 32. How Could You, Jean? (William Desmond Taylor) 5 reels. 6/23/18. Oyuncular: Casson Ferguson, Herbert Standing, Spottiswoode Aitken, ZaSu Pitts. 33. Johanna Enlists (William Desmond Taylor) 5 reels. 9/15/18. Oyuncular: Anne Schaefer, Fred Huntley, Monte Blue, Douglas MacLean, Emory Johnson, Wallace Beery. 34. Captain Kidd, Jr. (William Desmond Taylor) 5 reels. 4/21/19. 35. Daddy-Long-Legs (Marshall Neilan) 7 reels. 5/12/19. Oyuncular: Mahlon Hamilton, Marshall Neilan, Wesley Barry. 36. The Hoodlum (Sidney Franklin) 6 reels. 9/1/19. Oyuncular: Max Davidson, Dwight Crittenden, Andrew Arbuckle, Ralph Lewis, Buddie Messenger. 37. Heart o' the Hills (Sidney Franklin) 6 reels. 12/1/19. Oyuncular: John Gilbert, Sam DeGrasse, Claire MacDowell. Mary Pickford'un lobi kartı. Frances Hodgson Burnett'nin kaleme aldığı Küçük Lord romanının film uyarlaması olan Little Lord Fauntleroy filminde Sedric Errol (Mary Pickford)'un Minna'nın oğlu Tom (Francis Marion)'u dövmeye kalkıştığı sahne (1921). 38. Pollyanna (Paul Powell) 6 reels. 1/18/20. Oyuncular: William Courtleigh, Helen Jerome Eddy. 39. Suds (John Francis Dillon) 5 reels. 6/27/20. Oyuncular: William Austin, Theodore Roberts, and Lavender (the horse). 40. The Love Light (Frances Marion) 7 reels. 1/9/21. Oyuncular: Fred Thompson, Evelyn Dumo, Raymond Bloomer. 41. Through the Back Door (Alfred E. Green and Jack Pickford) 6 reels. 5/17/21. Oyuncular: Gertrude Astor, Elinor Fair, Wilfred Lucas, John Harron, Adolphe Menjou, Peaches Jackson. 42. Little Lord Faunteroy (Alfred E. Green and Jack Pickford) 10 reels. 9/16/21. Oyuncular: Claude Gillingwater, Kate Price. 43. Tess of the Storm Country (John S. Robertson) 10 reels. 11/12/22. Oyuncular: Lloyd Hughes, Gloria Hope, Jean Hersholt. 44. Rosita (Ernst Lubitsch) 9 reels. 9/3/23. Oyuncular: George Walsh, Holbrook Blinn, Irene Rich, George Periolat. 45. Dorothy Vernon of Haddon Hall (Marshall Neilan) 10 reels. 5/25/24. Oyuncular: Allan Forrest, Anders Randolph, Clare Eames, Estelle Taylor, Lottie Pickford, Marc McDermott. 46. Little Annie Rooney (William Beaudine) 10 reels. 9/18/25. Oyuncular: William Haines, Gordon Griffith, Carlo Schipa, Vola Vale. 47. Sparrows (William Beaudine) 9 reels. 9/26/26. Oyuncular: Gustav von Seyffertitz, Mary Louise Miller, Roy Stewart. 48. My Best Girl (Sam Taylor) 9 reels. 11/13/27. (Mary Pickford'un son sessiz filmi) Oyuncular: Charles "Buddy" Rogers, Hobart Bosworth, Mack Swain, Lucien Littlefield. 49. Coquette (Sam Taylor) 9 reels. 3/30/29. Oyuncular: John Mack Brown, George Irving, Louise Beavers, Matt Moore. 50. The Taming of the Shrew (Sam Taylor) 8 reels. 10/26/29. Oyuncular: Douglas Fairbanks, Geoffrey Wardwell, Dorothy Jordan, Clyde Cook. 51. Kiki (Sam Taylor) 10 reels. 3/14/31. Oyuncular: Reginald Denny, Margaret Livingston. 52. Secrets (Frank Borzage) 9 reels. 3/16/33. Not: Tarihler filmlerin gösterime giriş tarihleridir. Wikimedia Commons'ta Mary Pickford ile ilgili medyaları bulabilirsiniz. Bu sayfa son olarak 13 Ekim 2018 tarihinde ve 13.48 saatinde düzenlenmiştir.